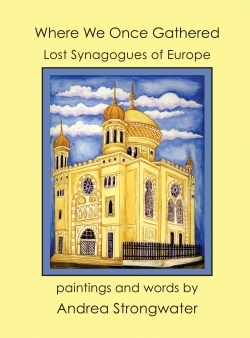 This painted history of exceptional, sacred Jewish spaces, mostly from the 1700s, 1800s, and 1900s, pivots around their destruction under German rule during WWII. In their absence, these built symbols of faith and beauty were instantly transformed into symbols of oppression and hatred. Quoted passages referring to God’s love for people of all faiths, used in the structures’ original dedication ceremonies, are particularly stirring in this context. From Latvia to Italy, the prominence of the Jews as integral to their diverse communities shines through. A unique love letter from the author to her ancestors. Ages eight and up.